This tasting and review followed that of the Benraich 15 year old PX cask finish. The Sonnalta has a similar rosy hue to the Benraich in the glass, but the aroma is much lighter and cleaner with well defined elements of fruit, (damsons and sloes), some light smoke like from singed hot cross buns, and some of that complex slightly herby Glenmorangie aroma. The delivery is again rich and syrupy with lots of sweet fruit, glace cherries, blackcurrant and damsons, but there is clear malt whisky backbone to this dram which was lacking in the Benraich. The characteristic hints of vanilla, lavender and cinnamon are refreshing and reassuring under the cloak of all the delicious syrupy fruit. The finish is mellow like buttered toast with blackcurrant jam. A fine end to a fine malt. Compared to the Benraich this is much more elegant offering, the malt and cask marrying in a much more harmonious balance each contributing the whole. Holy crap. I haven't seen a 95 in some time. . . .
Is it just me or has there been a trend to mark lower in reviews recently. I think this is as near perfection as you can get for a cask finished malt. Nose: Right away I’m taken with how sweet this is. It’s a veritable fruit basket here, with grapes, raisins, apricots, berries, apples, plums, peaches, and tangerines. Then we have Amaretto, brandy-esque floral notes, caramel, and big oak. Oddly, the thick, syrupy-sweet caramel notes with the prominent oak almost reminds me of bourbon. Ironic, as this also boasts big-time sherry aromas too. This is a complex, sweet, delicate nose. I need to familiarize myself with the bolder releases by Glenmo. They always seem like such light sippers to me. This one is a step in the right direction. Good abv, good intensity, and well-picked sherry casks. I like that they didn’t skimp on the finish, giving it a solid two years in the PX casks. This represents the sweeter side of sherried whiskies, and I often find myself reminded of Benriach 12 yo Sherry Wood. But this is better. Why? Aside from being more complex, it’s also more refined. Despite being bold and rich, it’s also retained a polished delicacy. As a Glenmorangie release, there’s an intrinsic, built-in softness and gracefulness, no doubt a result of those towering 26-foot stills. It seems to be contradictory, but the boldness marries beautifully with the delicacy. It’s brazen, yet sophisticated. I’ve enjoyed both the budget range and the overpriced Quarter Century. Seems the real gems are the mid-range annual special releases. This is the most robust and stylish release Glenmo I’ve ever tried. @hunggar, thank you for an excellent perceptive review. I rated Glenmorangie Sonnalta PX at 90 just as you have, but I would also say that Sonnalta PX drinks bigger and more preferably to me than that number would indicate. I include Sonnalta on my profile favourites list, even though there are whiskies which are not on that list to which I have given higher numbers. I have given a lot of tastings to new whisk(e)y drinkers, and I have found that Glenmorangie Sonnalta PX has been the #1 most universally well-liked whisk(e)y overall among all types of whisk(e)y presented. And, yes, @hunggar, to my surprise, a lot of people who have tried both whiskies for the first time have loved Sonnalta PX and not cared much for Glenfarclas 15. I notice, too, that Sonnalta seems to have grown on you, compared to the first comments which you made about it online. The first time I tried Sonnalta PX, I thought, "This might be too sweet for me." The second time I drank some I said to myself, "No, it's not too sweet!" It's always nice to see Sonnalta-praising and relive "the first time." You pull out a lot of aromas/flavors-- Wow I need to go back and check! Like you, I also pull the bottle out only occasionally now, and find it gets more "peppery" (drier? ), but at the expense of the creaminess of its fresher days. I'll look for your follow-up. @Victor, I have had exactly the same experience with Glenfarclas 15, expecting newbies to like it as much as I do; the Sonnalta wins out. Finally, @hunggar, if only you weren't a world apart, at the moment I only lack the Finealta of the series, which I agree are "real gems". I think you'd find the Sonnalta the boldest (except the higher ABV Astar, which I would gladly bottle-swap...), but I'd be curious if the Ealanta would meet your criteria-- I even titled my own review "elegant yet substantial", similar to your description of Sonnalta here. Otherwise I would make sure you've tried the Signet, another Glenmo with "quality sweetness" as you phrase it. In the end that's probably my overall favorite. Much praise has fallen on the Glenmorangie Sonnalta PX since its 2009 release, and it even used to be in the top 10 (or 3!) whiskies on Connosr. Uunfortunately bottles are increasingly scarce, so the decision to purchase one is harder. I wanted more input than 'thumbs up' or a list of flavors and so asked the Connosr forums: What was so special about this malt, at only 12 years old? What whisky does it resemble? Finally with a bottle, I happily sought to answer my own questions. Nose: The overall impression is of elegant raisin cream with a refined tannin. At first, a grape theme is apparent: Concord grape pie, grape flesh, or raisins. This is combined equally with vanilla-cream and silky caramel. Of secondary prominence is that noticeably "deep and sharp" tannic overtone (like grape skins, or allspice, lemon rind, 100% cocoa powder, almond skins, or maybe amaretto). And thirdly, if you keep pulling, there is a floral smell: like rose petals or an overripe yellow pear. Palate: Orange-zest entrance mellows quickly to caramel/rose/skim-milk. With growing heat, a tobacco-like amaretto sensation overtakes. Above this, a dry cocoa powder tannin comes in as a dominant impression. Vanilla-toffee tails into the finish. Finish: That vanilla-toffee becomes a rose-like grape-iness, and the dry cocoa sharpness comes back, with potpourri. It is fairly long, with potpourri and that dry dark-chocolate/almond-skin/grape-skin tannin injecting some intrigue. Overall: Back and forth between mellow (raisin-milk-vanilla-rose) and spice (cocoa-potpourri-zest). Like biting into ripe purple grape and alternatingly tasting the sharp skins and the sweet, thick inner flesh. So is the Sonnalta special? Based on my limited experience with 20ish sherried unpeated malts, I would say "kind of." My mind has categorized 2 classes of sherried malts-- broadly speaking. The first are the fruity or "cherry" themed ones, which fall within a spectrum from apple-orange-cherry-peach-apricot-plum. For examples: various Aberlours, the Glenfarclas' 15/21/40, Macallan's 10 and 1824 series, Glenlivets 18/25 Glengoyne 21, Glenmorangie 25, etc. The second group are the "tannic" ones. I usually describe the feature as almond skins/100% cocoa powder/grape skins, or as dry, sharp, bitter, tannic, or sophisticated. (Others have termed it sherried smokiness, though 'steaminess' would better clarify the lack of peat.) For examples, Glenfarclas' 25/30, Macallan 18, Auchentoshan 3Wood, Glenmorangie Lasanta. These are much less fruity than the first group, and their nuttiness is more of a walnut tone. The Sonnalta is a member of this 2nd group (perhaps most like Macallan 18), except that the tannic cocoa edge is milder and fruit is not absent (grape, the dominating one, is not characteristic of group 1). I have not previously identified raisin as the main fruit influence in a sherried malt; I even wondered whether liquid sherry was mixed into the Sonnalta. My feeling is that the Sonnalta is distinctive in presenting a character of raisins and milk to balance out the tannic forces. The Glenfarclas 15 also hit a middle ground, but I find it a bit more playful etc. So is all the above enough to justify a purchase? If you can allay curiosity by imagining the sensations (based on my and others' reviews)-- or better yet actually acquiring a sample-- then it should come down to substitutes. For instance, I would not imagine that the experience is justified costing much more than the Signet or of the Macallan 18 Sherry. There is not the multitude of spices as found in e.g. Glengoyne's 21, and the palate and nose are not as dynamic as e.g. Glenfarclas 15. And looking ahead, I would guess it it should be easy to repeat the 12 yo Sonnalta creation in the future? But this should not take away from the fact that the Sonnalta is an Scotch, really smooth, tasty, refined, and pleasurable. @vanPelt, that is quite an elegant and nuanced review. Thank you. Now if we all only tasted and interpreted everything the same ways as each other we would be all set! Most meaty indeed, this review. As to whether Glenmorangie Sonnalta PX is easily repeatable,...well, there will be a different and unique set of casks used the next time the projectc is tried, so the whisky will not be just the same, even if the distillate is pretty close to the original. Thanks Victor; and polite of you to call it meaty rather than outright bombast ;-) But I have never so deliberated a purchase, and this one seemed worthy of attention. I agree that each reviewer's phrasing of perception needs interpretation. My standpoint is that Connosr's very function is sensible only if our chances at conveying a whisky are better than "describing blue to a blind man"! Palate: creamy toffee, burnt toast, milk chocolates, cocoa, distinct fruitiness of stewed fruits. Very thick. Finish: brown sugurs, dark chocolate, some red fruits. Probably my favourite Glenmo, kills the other Glenmo sherry finish in there standard range though is a bit more expensive. I found it tastes a little like the signet except it's got a better nose and a nicer finish. The Sonnalta PX is, like the Lasanta, finished on sherry. In this case, it was a Pedro Ximinez sherry cask. The Sonnalta PX was originally released in the duty free range (hence the Private Collection credo), but by now can be found in retail as well. It is less creamy and less sweet than the Lasanta, but very expressive indeed. Oranges, toffee, raisins and some mint. Flints, even. Gooseberries, roasted nuts, quite a bit of green banana and apricots. Acacia honey and corn flakes. Shuffles towards brown sugar. Develops nicely in the glass and easily surpasses the Lasanta in terms of complexity. It fills the mouth completely and explodes with vanilla, coffee, oranges, grapefruit and wood berries. The whole is lightly peppered. This is almost a liqueur, almost syrupy. The finish is long and zesty. At last a Glenmo that is really succesful in my book. This is simply delicious and very fit to accompany dessert (chocolate mousse for example). About 50 EUR. Thanks to Ruben for the sample. Outside: Cold, windy, grey skies filled with Rain...one thing is for sure, that there is one warm, delicate, sweet and fantastic dram that keeps me warm: Sonnalta PX of Glenmorangie. The colour of the Sonnalta PX is beautiful dark golden. Added a bit water, and the nose brings me to levels of milk chocolate, vanilla, thick sugary syrup. Great fragrances of crisp caramel and sweet liquor. The taste is 'in one word...Fantastic!'. a Sweet palate with great fruits, roasted almonds and hazelnuts drenched in brown sugar. The finish is long and getting from toffee, caramel like to pure enjoyment of sweetness. This great dram is for me a real good one. For sweet tooths is this one just for you...but, it is a rare whisky, the fantastic Sonnalta PX of Glenmorangie, cause it is a limited edition from Glenmorangie's 'Private Edition'. I'm really glad that I own a bottle. I'm indeed very a happy man that I own a bottle of this fantastic Artwok of Glenmorangie. My bottle is half full, so I surely will look around for a second one! Enjoy your sunday with a good glass of Sonnalta PX, Victor!! Fantastic it is! Buy it while there is still some of it around. Nose: A very sweet whisky with cinnamon rolls, icing, raisins, Christmas spice, maybe even some banana bread and milk chocolate. There's also a distinct bourbon-like sweetness. Taste: Thick maple syrup, toffee, icing again. Velvety mouthful. With water the sweetness is toned down a bit. Finish: The bourbon-like sweetness returns with very pleasant oak and some nuttiness. Goes a tad dry at the end. This is a sticky sweet whisky that manages to remain pleasant and not cloying. Glenmorangie did this finishing very well. Also, be careful, as it is easy to drink. Nose: Perfumed gentle Sherry wine is prominent. There is also sweet orange, a floral bouquet, and a touch of honey. Taste: Big flavour, with the sweet sherry immediately apparent. This whisky is quite sweet with some nice balancing dryness sneaking in within a few seconds. The fruitiness from the nose is also apparent on the palate, as is some subtle honey. A moderate barley maltiness is also in evidence. I think that it is a good thing that this is 46% ABV-- I don't think that 40% would work here to adequately balance the sweetness with alcohol dryness. Finish: Excellent long flavourful balanced finish leaves the flavours declining gradually together. Balance: The first time I tasted this whisky I wondered if it was too sweet for my taste. On second taste I decided that it was not. This one just grows and grows on you. I soon went out to buy a second bottle because I wanted this one around and supplies of Sonnalta PX in my area are rather small. This is a great sherried whisky that I would recommend to anyone. The only problem I have encountered with the Glenmorangie Sonnalta PX is that if I share it with friend that they want to drink a lot of it! @Victor, I've coveted the Sonnalata, Signet, and even Astar for quite some time, and because they are all on the pricey side, I've not tried them yet. Besides ... I feel that I have enough wonderfully sherried Scotches to last me a few years (Aberlour A'bunadh, Glendronich 15 Revival, Glenrothes 1991, 1992, Macallan 12, Quinta Rubin (port), and Glenmorangie Lasanta. This is, right now, a brandy night for me ... sipping Mexican, German, French, Califorian, Albanian, Spanish and Armenian brandy. So after seeing what is new on Connosr, and being directed to your Sonnalata review, Victor, I decided to taste the Lasanta, just to see if there was any perceived sulfur; my palate is not the most accurate and reliable but I very much enjoyed the Lasanta, and didn't notice any sulphur. I still feel that it is a best-buy ... and BTW, it has won many metals. But I will indeed watch out for some Sonnalata ... even a sip or two would be revealing. A useful review, as usual .. thanks Victor ! @mrbubb, Sonnalta PX keeps its charm and wears extremely well. If anything, I am more enthusiastic about it now than when I wrote this review. There is good reason that this whisky is as I write this comment # 3 highest rated among Connosr members. As I have posted elsewhere on Connosr, when I introduce new or nearly new whisky drinkers to a large variety of whiskies, the Glenmorangie Sonnalta PX is usually the single most popular whisky from all nations and styles of origin. A note about Quinta Ruban, my bottle actually gelled nicely after a number of months of being open (7 months, I believe). I like it quite a lot now. Good luck finding some Glenmorangie Sonnalta PX. It's worth it! I am very excited about this whisky. I have really enjoyed the Glenmorangie whiskies I have tasted so far: 12yr Port Wood Finish, La Santa, Quinta Ruban, 18yr, etc.... Even the 10yr was ok. However, the Sonnalta PX is a very special whisky to me. It is matured for 10 years in American white oak casks, before transitioning for two more years into Spanish ex-Pedro Ximenez (PX) casks. These casks are referred to by the distiller as the "king of sherry casks". Among others, the whisky gets some very impressive remarks: Jim Murray's Whisky Bible 2010 "It is, unquestionably, the perfect whisky finish" (96.5 / 100). But that's enough about what others say. Let's get on with the review! 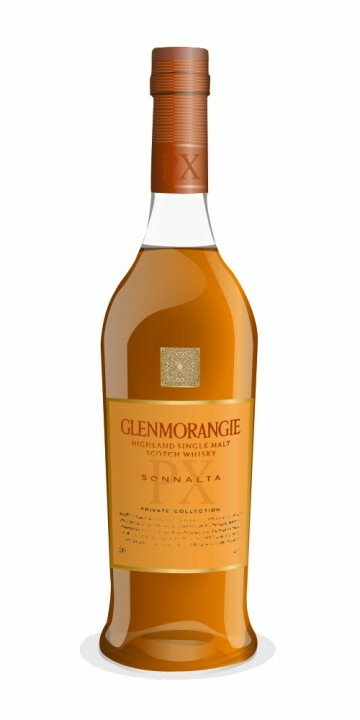 The Glenmorangie Sonnalta PX is a 12yr whisky, bottled at 46% ABV. Body: Plenty of firmness to provide a perfect mouth feel. Palate: Spice up front, with honey and marmalade. Maybe just a touch of dark chocolate. Finish: Slight dryness with a magnificently long apricot finish! Spice rolling through my mouth. Delicious! I am really enjoying this whisky. I am not a big fan of dryness in my whisky, but this is a very slight flaw, as it just comes in on the front of the finish, and fades quickly. The nose is probably the best part of this whisky, but the palate and finish also has a lot to offer. I am not sure how much this whisky costs, but I will have to find out. It is very tasty, and I would enjoy having a bottle of it in my cabinet. However, I am afraid it will be priced a bit higher than it is worth. It is basically a sherried whisky with spice. I can think of three excellent whiskies that share this same basic profile: Aberlour 16yr, Macallan 12yr, and Glenfarclas 10yr. There is no smoke or caramel, so for my taste, I much prefer Glenfarclas 15yr. But, it's still a really good whisky! This is one of my top favorite malts. It may be pricey, depending on location. Around here the better priced outlets sold out of this long ago, and only a very few more pricey shops are still likely to have a bottle of this around. I like this so much I hustled to get a second bottle before it disappeared. Didn't know the length of the sherry aging until you posted it. Thanks for that info. One problem with this whisky if you buy a bottle and decide to share: people tend to want to drink more of it than a small first dram! Another whisky to be cherished and shared only with good friends (those who can be relied upon not to drown it with water or freeze with an ice cube) Sonnalta's gone and effortlessly knocked Highland Park 18yo off the top spot for me. It's a 'yummy' whisky if that makes sense ... it starts with a rush of sweetness - obviously contributed by señor Pedro Ximenes - followed by coffee and chocolate notes, followed by "just a spot more please" or "un poco más, por favor". For the cash-strapped whisky drinker it's not cheap (about £65 a litre in World of Whisky) but it's worth every penny. A gorgeous and sophisticated whisky from an adventurous distillery. I can't afford another bottle until my birthday rolls around but I'll not grudge them a penny of the cost price (while hoping they manage to hold it below £70/litre). Drugs: Just say no; Sonnalta: Just say yes. Hi there bwmccoy (Scottish antecedents perhaps? ), Xmas greetings from sunny Alcossebre. I know Seattle quite well (brother in law works in Pioneer Square) and it's charming to think of a Glenmo expression matured in Spanish barrels bringing some andalucian brightness to the Pacific North-West. There's some Arctic weather on its way so I'll be breaking out the Ardbeg to stave off winter chills. Nose: aromatic and luscious. A very complex play of chocolate, raisins, almonds and toffee. Spicy as well: vanilla, cinnamon, ginger. Richly sherried but it respects the original spirit, with hints of apricots, honey and oranges. Wonderful notes of toasted nuts. Sweet, rich and quite magical. Mouth: good mouthfeel with vanilla, lovely coffee beans and blood oranges. Sweet and coating but never too sugary. Soft pepper. Tobacco. Plums. Again perfect balance between malty flavours and the sherry. Very polished. Finish: long and creamy, on demerara sugar and spices. Just bought a bottle of this today. If it were one iota sweeter than it is, it would be too sweet for my taste. As it is, this is fantastically good whisky. Among other things this will serve as a first rate digestif.